The phone rings. "You're coming to Jerusalem, right?" says Janice. "For the protest!" Janice says, completely exasperated with me. "Ah, I can't make it." "But, you HAVE to make it! Everyone has to come! Israel can not give up Jerusalem! Without Jerusalem, the Jews are again a scattered people with no live link to the past and only fragile hopes for the future. You better come to Jerusalem because this is a critical moment in Jewish history." Jerusalem is holy to more people than any other city on earth. For Muslims, Jerusalem (known as Al-Quds, the Holy) is where Muhammad ascended to heaven. For Christians, Jerusalem is where Jesus walked, was crucified and resurrected. Why is Jerusalem a sacred city for Jews? Jewish ties to Jerusalem go back to the time of Abraham, the father of Judaism. To test Abraham's faith in God, God said to Abraham, "Take, I beg of you, your son, your only son, whom you love, Yitzhak, and get yourself to the land of Moriah and offer him up there as an offering on one of the mountains on which I will tell you." (Genesis 22:2) It is on Mount Moriah in Jerusalem that Abraham passes God's test of faith. Mount Moriah came to symbolize for the Jews the supreme embodiment of their relationship with God. Then, "Abraham named this place: God Sees, which today is expressed as follows: On the mountain of God is one seen." (Genesis 22:14) From this Jews understand that in Jerusalem, unlike any other place on earth, God is almost tangible. In approximately 1000 B.C.E., King David conquered the Canaanite center called Jebus. Then he built the City of David on the southern slope of Mount Moriah. One of David's first acts after conquering Jerusalem was to bring into the city the Ark of the Covenant which contained the Tablets of the Law. With the transfer of the Ark of the Covenant, Jerusalem became a holy city and the center of worship for the Israelites. It was David's son, Solomon who built the Temple for God on Mount Moriah in Jerusalem, inaugurating it in 960 BCE. The mostly costly materials and advanced builders were used to create this magnificent Temple, which would house the Ark of the Covenant. According to the Book of Kings, God responded to Solomon's prayer by accepting the Temple and promising to continue the Covenant with the Israelites on condition the Israelites keep God's laws. After Solomon's death, the Kingdom of Israel became divided and Jerusalem's state declined. The prophet Isaiah warned the Jews about their religious obligations. Isaiah also envisioned Jerusalem's future role as a religious center that would inspire people to follow God's laws. Under the influence of Isaiah, King Hezekiah (727-698 B.C.E.) purified the Temple and strengthened the walls of Jerusalem. In an effort to ensure Jerusalem's ability to withstand a siege, Hezekiah also dug a water tunnel, 533 meters long, from the spring of Gihon into a reservoir inside the city walls at the pool of Siloam. Unlike the Assyrians, the Babylonians, in 586 B.C.E., succeeded to conquer Jerusalem. The Babylonians, led by Nebuchadnezzer, destroyed the Temple and exiled the Jews to Babylonia. Even in exile, however, Jews never forgot their holy city of Jerusalem. By the rivers of Babylon, there we sat down, yea, we wept, when we remembered Zion. We hung our lyres under the willows in its midst. For there they who carried us away captive asked us for a song: and tehy who spoiled us asked us for mirth, saying. "Sing us one of the songs of Zion." How shall we sing the Lord's song in a foreign land? If I forget thee, O Jerusalem, let my right hand lose its cunning. If I do not remember thee, let my tongue cleave to the roof of my mouth. (Psalm 137: 1-6). When the Persians overran Babylonia in 536 B.C.E., the Persian ruler Cyrus the Great issued a proclamation allowing the Jews to return to Judea and rebuild the Temple. Despite extremely difficult conditions, the Jews completed rebuilding the Temple in 515 B.C.E. And all the people raised a great shout extolling the Lord because the foundation of the house of the Lord had been laid. Many of the priests and Levites and chiefs of clans, old men who had seen the first House, wept loudly at the sight of the founding of this House. Many others shouted aloud for joy so that the people could not distinguish the sound of the shout of joy from the sound of the weeping of the people and the sound was heard afar off. Nechamiah rebuilt the walls of Jerusalem, and Jews lived relatively peacefully in their holy city for hundreds of years under the rule of different nations. In 332 B.C.E, Alexander the Great conquered Jerusalem from the Persians. After Alexander's death, the Ptolemies ruled Jerusalem. In 198 B.C.E., the Seleucids took over Jerusalem. While initially, Jews enjoyed freedom of religion under the Seleucid ruler Antiochus III, this ended with the rise to power of his son Antiochus IV. In an effort to unite his kingdom, Antiochus IV tried to force the Jews to adopt Hellenistic culture and religion. The study of Torah was forbidden. Jewish rituals, such as circumcision, became punishable by death. Judah Maccabee, of the Hasmonean family of priests, led a rebellion of loyal Jews against the great Seleucid forces. The Maccabees were able, against great odds, to regain control of the Temple Mount. The prophet Zachariah sums up this Maccabean victory when he wrote, "Not by might, not by power, but by My spirit." The Temple, which had been desecrated by the Greek-Syrians, was cleansed and rededicated to the One God of the Jews. The whole army was assembled and went up to Mount Zion. There they found the Temple laid to waste, the altar profaned, the gates burnt down, the courts overgrown with weeds like a thicket or wooded hill-side, and the priests rooms in ruin. They tore their garments, and wailed loudly, put ashes on their heads, and fell on their faces to the ground. They sounded the ceremonial trumpets, and cried aloud to Heaven. Later Hasmonean rulers did not follow in the righteous ways of Judah the Maccabee. The Romans moved into help rule Jerusalem, and then took over control of the city and its surroundings. The Romans appointed Herod as King of Judea in 37 B.C.E. Herod embarked on a massive building campaign which included the building of the Second Temple. The building of the Second Temple required nearly twenty years of work, more than ten thousand workers, advanced engineering know-how, massive stones and costly materials such as marble and gold. Herod's building campaign made Jerusalem one of the most impressive cities in the world. According to the rabbis of that day, "Ten measures of beauty descended to the world; nine of them were allotted to Jerusalem." Relations between Jews and Romans deteriorated as the Romans began to impose their ways on the Jews. One Roman edict commanded that Jerusalem be decorated with statues of the Roman emperor, which transgressed Judaism's opposition to graven images. The quarrels quickly escalated into war. Titus lead Roman forces to conquer the city of Jerusalem. When the Romans encountered surprisingly strong opposition by the Jews, led by John of Giscala in the Lower City and Temple Mount and by Simon Bar Giora in the Upper City, the Romans bombarded the city with battering arms and heavy stones. Despite the intentions of Titus and Caesar to the contrary, the Second Temple was burnt and destroyed during the fighting. After the Roman conquest of Jerusalem, Jews were banished from their holy city. While in exile, Jews never stopped mourning for and praying to return to Jerusalem. The word Zionism - the national movement of the Jewish people - comes from the word Zion, one of the Jewish names for the holy city of Jerusalem. Three times every day, when Jews pray, they face to the east, toward Jerusalem, and pray for their return to the Holy City. After every meal, Jews pray that God will "rebuild Jerusalem speedily in our days." "Next year in Jerusalem," is recited by every Jew at the end of the Passover Seder and at the end of the Yom Kippur fast. At Jewish weddings, a glass is broken in commemoration of the destruction of the Temple. Blessings recited during the Jewish marriage ceremony pray for the return of Zion's children to Jerusalem and for the sound of joyous nuptials to be heard in Jerusalem's streets. In exile, Jews continued to make pilgrimages to Jerusalem three times a year, during the festivals of Pesach (Passover), Sukkot (Tabernacles) and Shavuot (Pentecost). These pilgrimages to Jerusalem began when Solomon built the First Temple. Jews from all over the country would travel to Jerusalem to bring sacrifices to the Temple, study Torah, pray and celebrate. Once the Romans went to conquer the Jewish city Lydda, but they found the city empty because all the Jews had gone to Jerusalem for the Feast of Tabernacles. During the Second Temple, Jewish pilgrims would travel to Jerusalem from Alexandria, Antioch, Babylon, and even from distant parts of the Roman Empire. After the destruction of the Second Temple, the Romans did not allow Jewish pilgrims into the city. However, Talmudic sources say that some Jews secretly made their way to the site of the Temple anyway. When Jews were again allowed into Jerusalem in the fifth century, Jerusalem witnessed massive pilgrimages. From then until the present day, Jews have continued to make pilgrimages to Jerusalem during the three pilgrimage festivals. The Western Wall, a section of the wall that surrounded the Temple Mount and the only remains of the Second Temple, became for the Jews in exile both a reminder of their glorious past and a symbol of hope for their return to Jerusalem. Jews consider the Western Wall, sometimes called the Wailing Wall, to be their holiest site. For centuries, Jews have traveled from all over the world to pray at the Wall. The most popular custom is to write prayers on paper and place them in the crevices of the Wall. The Wall has become a favorite site for religious ceremonies such as the Bar Mitzvah and for nationalistic ceremonies such as the swearing-in of Israeli paratroopers. Jews lived in Jerusalem since they were allowed back into the city in the fifth century. However, Jews became the largest single group of inhabitants of Jerusalem in the mid-nineteenth century, while the city was under Ottoman rule. In 1860, a wealthy British Jew named Sir Moses Montefiore purchased land outside the gates of Jerusalem, and founded there a new Jewish neighborhood - Mishkenot Shaánanim. Soon after, other Jewish neighborhoods were also founded outside the Old City of Jerusalem. These Jewish neighborhoods became known as the New City of Jerusalem. Following World War I, control of Jerusalem was transferred from the Ottomans to the British. During the British Mandate, Jerusalem's Jewish community built new neighborhoods and buildings, such as the King David Hotel, the Central Post Office, Hadassah Hospital, and Hebrew University. As Jewish Jerusalem was growing faster than Arab Jerusalem, tension in the city between Arabs and Jews increased during the British Mandate. In an effort to control the rising tension, the British issued the White Paper in 1939, a document limiting Jewish immigration to Palestine. A few months later, Nazi Germany attacked Poland, starting World War II. The hundreds of thousands of Jewish refugees in Europe at the end of World War II put pressure on Britain to revoke the White Paper. However, the Arabs did not want an influx of Jewish refugees into Palestine. The British were not able to control the rising violence between the Arabs and Jews, so they brought the issue of Palestine to the United Nations. On November 29, 1947, the United Nations approved a partition plan for Palestine. The plan ended the British Mandate over Palestine, and gave part of the country to the Jews and part of the country to the Arabs. The Arabs rejected this partition plan and declared war. Arab forces besieged Jerusalem. In six weeks, 1490 men, women and children - 1.5% of the Jerusalems Jewish population - were killed. Arab forces seized the Old City, and expelled the Jewish population. The Old City and its holy places, then, became part of Jordan. Jordan did not allow Jews to visit the Western Wall or other holy sites, a direct breach of the 1949 UN armistice agreement that ensured free access to holy sites. The Jordanians destroyed hundreds of Jewish graves, some of which were from the First Temple Period. Jewish synagogues were also desecrated and destroyed. Jews, however, remained in the New City of Jerusalem. Upon the establishment of the State of Israel, Jerusalem was declared the capital of the Jewish State. Thus Jerusalem was a divided city, with the eastern part belonging to Jordan and the western part serving as the capital of the Jewish State of Israel. In 1967, Israel's neighbors challenged her borders. Syria regularly fired artillery at northern Israeli settlements, and the Syrian air force encroached upon Israeli air space. Egypt closed the Straits of Tiran, which was a virtual declaration of war. And 100,000 Egyptian troops began moving across Sinai toward Israel. With fears that Arab aggression was imminent, Israel struck on June 5, 1967. Citizens of Jerusalem! You, the inhabitants of our Holy City, were called upon to suffer the vicious onslaught of the enemy... In the course of the day, I traveled through Jerusalem. I saw how its citizen, rich and poor, veteran and new immigrant alike, children and adults, stood steadfast. No one flinched; no one failed. You remained cool, calm, and confident while the enemy launched his assault upon you. You have proved worthy inhabitants of the city of David. Two days later, Israeli soldiers stormed through Lion's Gate and through the Dung Gate to take control of the Old City of Jerusalem, including the Western Wall and the Temple Mount. Within hours, Jews flocked to the Wall - some in a daze and others weeping out of joy. For the first time in almost 1,900 years, Jews now controlled their most holy site and their most holy city. An editorial in the Jerusalem Post reveals how Jews felt about the reunification of Jerusalem under Israel. 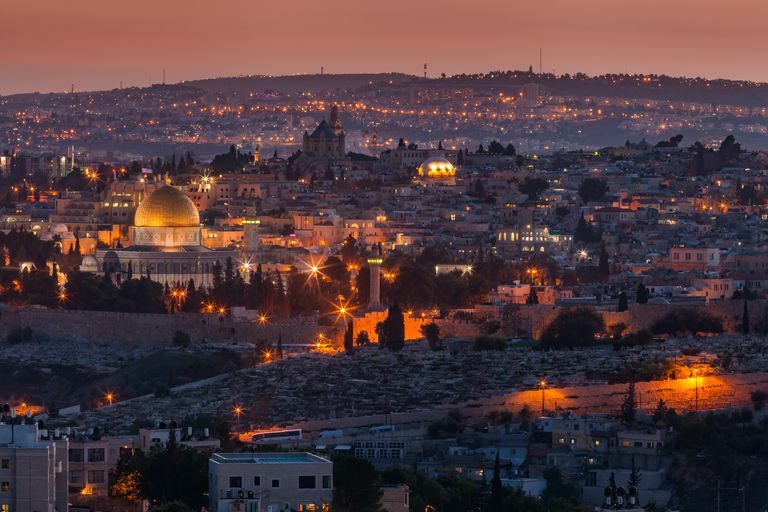 This capital city of the State of Israel has been the focal point of prayer and longing in the course of long tragedy-ridden centuries in the history of the Jewish People. Jerusalem suffered... Its population was killed or exiled. Its buildings and houses of prayer destroyed. Its fate packed with grief and sorrows. Undeterred by recurrent catastrophe, Jews throughout the world and throughout centuries stubbornly persisted in praying to return here and rebuild the city. Jewish ties to Jerusalem go back to the time of Abraham, are unbroken, and are unmatched in history. During the last 33 years of Jewish control of a unified Jerusalem, the rights of all religious groups were respected and free access to all religious sites was guaranteed. On January 8, 2001, thousands of Israeli men, women, and children plan to surround the city - by holding hands. They will peacefully protest the proposal to divide Jerusalem, giving east Jerusalem and the Temple Mount to the Palestinians in exchange for a Palestinian promise for peace. Would you join this protest?